SPRINGFIELD, Mass. 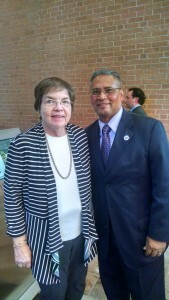 – State Representative, Jose Tosado, today announced his endorsement of Mary E. Hurley, Candidate for Governor’s Council. “My campaign slogan in my 2014 race for the 9th Hampden District was ‘Experience Counts’,” said Tosado. “I believe that when it comes to the Governor’s Council that statement holds true for Mary Hurley. For that reason, I am endorsing Mary Hurley for the 8th District of the Massachusetts Governor’s Council. I believe that she has the experience and knowledge necessary to effectively evaluate and record advice and consent on candidates for judgeships on behalf of the district. Having served as Springfield’s first and only female mayor from 1989 to 1992, Judge Hurley has the experience necessary to carry out the will of her constituents when elected. Her experience as mayor means that she will be sensitive to the evolving needs of the district she serves; she knows first-hand what it means to be an elected official and understands the commitment needed to represent the district. Mary Hurley also served as a district court judge from 1995 to 2014, personally gaining knowledge of the inner workings of the court system and the need for fairness and impartiality necessary for justice. It is my belief that Mary Hurley’s experience as a judge makes her uniquely qualified to perform the duties of a Governor’s Councilor. She is best qualified to evaluate the traits and characteristics necessary to appoint judges and clerks in this race because of her history serving our district courts.